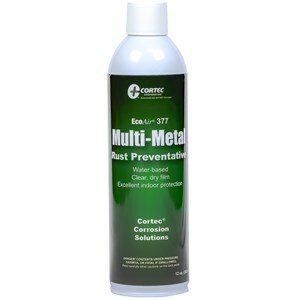 Cortec EcoAir VpCI-377 is a water-based rust preventative for temporary corrosion prevention. Provides protection up to 2 years. Forms a clear, dry hydrophobic film. It does not require removal before painting or further processing. VpCI-377 replaces oil based rust preventatives for indoor use. Multimetal applications. Protects ferrous and non-ferrous metals. Easily removable if necessary, simply use an alkaline cleaner. No hazardous decomposition by-products. Nonflammable, extinguishes fire. 12 oz.